Everything Same, Everything Different. 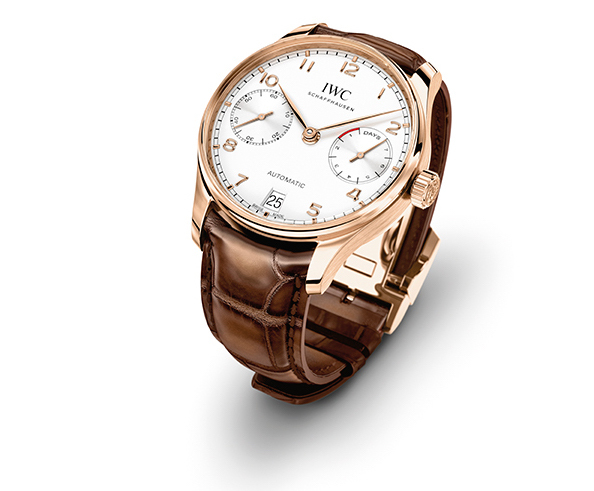 How Well Do You Know The New IWC Portugieser? There are two types of change — one is the change you make because you have to and the second is the change you make because you want to. It’s a good rule of thumb to hold that the second kind is usually better than the first, because that kind of change usually means you’re leading the pack whereas the first implies that you’re changing in order to catch up. There are also those who say that you shouldn’t mess around with a classic. These are the people who clutch their heads and write badly punctuated online pleas not to touch the design of the IWC Portugieser, because apparently if something isn’t positively falling apart at the seams, it’s insanity to try and improve it. One thing you must always remember about IWC: you can forget what the watches are called, when the movements were developed, you can forget who wears them on the red carpet and what novelties were just presented. But you must never forget that at their very core, IWC are engineers with an insatiable drive to make things work better. This philosophy, as succinctly articulated in their company motto, sets them apart from the rest of the industry and applies to more than just the mechanical aspects of the watch. Even the designs are subject to this perspective. The Portugieser watches of 2015 look very much like the Portugieser collection from before — the changes made will not be immediately obvious under casual observation. The dial crystal, for example, projects slightly off the level of the convex bezel for a very subtle bombé effect that smoothly falls off at the periphery. It perfectly echoes the roots of the original Portugieser watches of the 1940s and adds a richness of texture to the presentation of the watch. The lugs feature a marginally more tapered profile and the strap curves in at the attachment points in order to cleave closely to the case for emphatically luxurious yet austere appearance. The openworked rotor and the Probus Scafusia seal are more finely delineated than in previous iterations. When you look at the cal. 52000, the movement family which underpins four new watches in the IWC Portugieser collection — the Annual Calendar, the Automatic, the two variations of the Perpetual Calendar — what you see is an aggregation of smart solutions to fundamental problems such as friction and wear. You see selected components in high-tech ceramic, which many will assume to be a means to increase the prestige (and hence the price) of the movement. 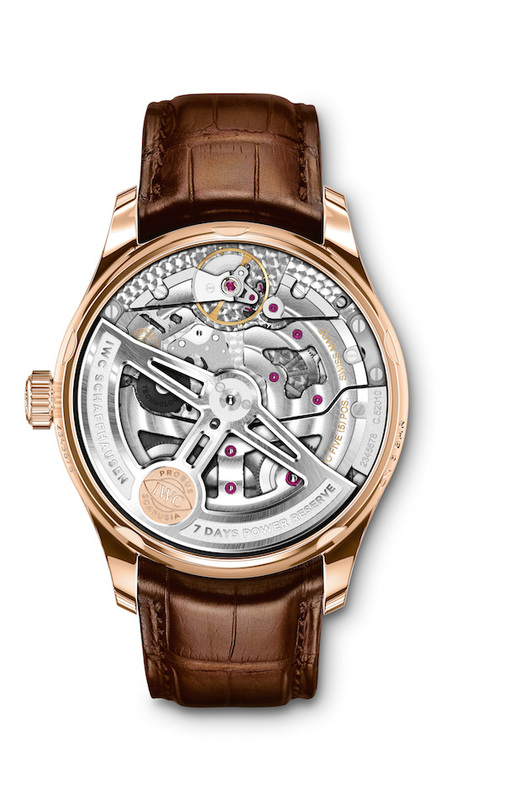 Knowing what you know of IWC, however, and their fierce dedication to efficient mechanical systems, you can discern that every component is placed with mindfulness and great consideration. 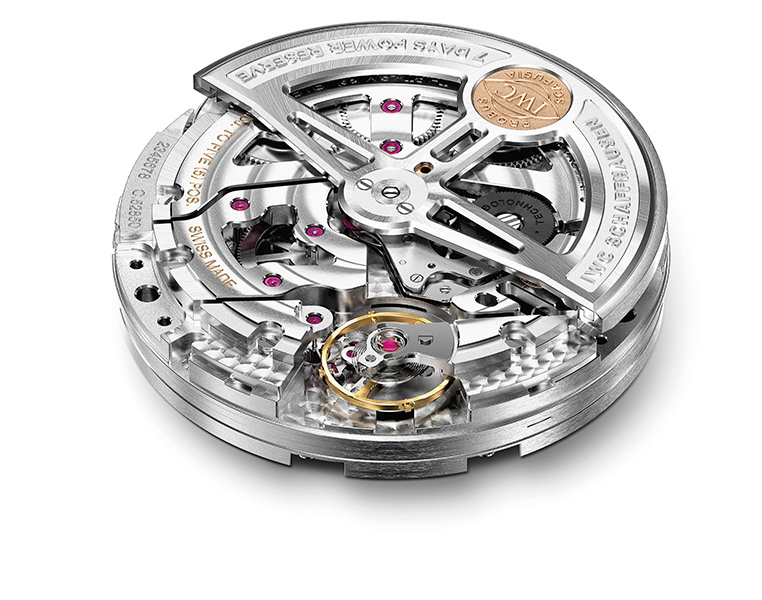 IWC was one of the first companies to use high-tech ceramic in a watch case, and this was way before injection moulding techniques were developed to drastically reduce the difficulty of creating complex shapes in ceramic. More recently, it’s become common to utilize ceramic ball bearings in high-usage, load-carrying components such as the automatic winding module, or perhaps a tourbillon. Apart from this extremely limited use, however, there are practically no watch companies apart from IWC that incorporate high-tech ceramic in functional areas of the movement. Prior to the introduction of the cal. 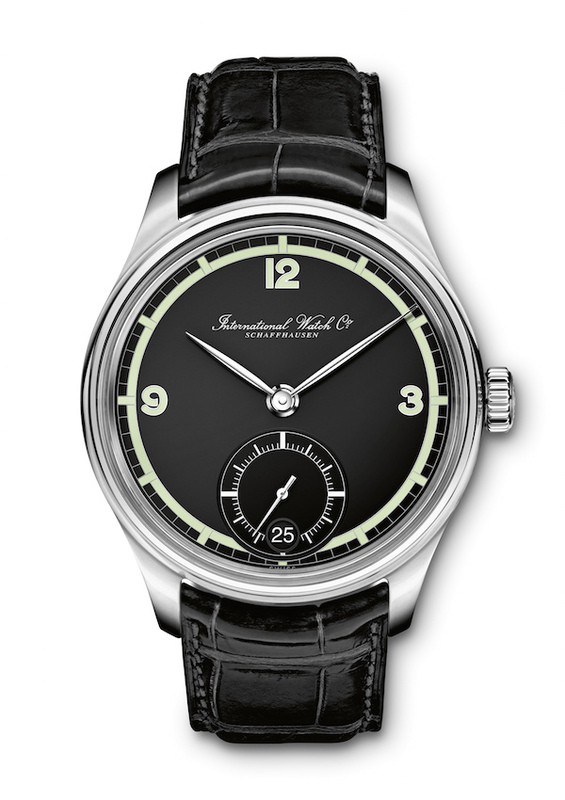 52000 family, the only long power reserve held by an IWC movement was the eight days of power in the hand-wound cal. 59000. The movement was a surprise success for the company, as initial assumptions were made about the overwhelming market preference for automatic watches. Combining the long power reserve with an automatic winding system, however, brings the mechanical watch ever closer to the performance ideal of perpetual unassisted operation. This is potent, frontier-pushing stuff — kicking at the expectations we all have of mechanical watchmaking. In the very near future, IWC are also poised to build upon two new caliber families that will guarantee an ironclad independence for all their movement needs. The cal. 69000 and the cal. 42000 will respectively occupy the entry-level IWC chronographs and time-only automatic watches. There is a new manufacture facility in the pipeline, due to commence operations in late 2016, which will enable the company to produce movements at the volume it needs and at the quality it demands. Bigger isn’t always better, but behind the doors of IWC in Schaffhausen, size often does matter. Perhaps the boldest move, in the eyes of IWC lovers, is the issue of an anniversary limited-edition watch with a dial that is relatively unknown. 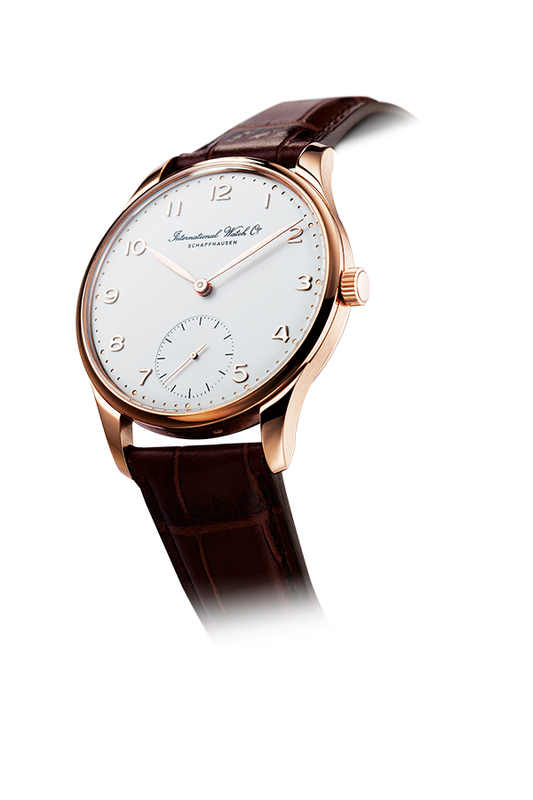 If you asked a thousand IWC collectors what the original Portugieser is supposed to look like, you would get a wide range of answers all pointing to the same set of aesthetic features — clean dial, “International Watch Company” written in flowing italic script, slim Arabic numerals, dot markers for the minutes and a minimalist small-seconds subdial. The Portugieser Hand-Wound Eight Days Edition “75th Anniversary” is inspired by a dial design from the original production run and comes in two versions: steel and red gold. The differences are stark and apparent, most conspicuously in the hour markers and the chapter ring, but it’s also immediately clear how the codes of the Portugieser still define every aspect of this watch. When REVOLUTION visited the Salon International de la Haute Horlogerie (SIHH) this January, our co-founder and group editorial director Wei Koh said to IWC CEO Georges Kern, “The new Portugieser is simply amazing. Everything about it is the same; everything about it is different.” I’m told that Mr Kern’s response to Wei’s statement was that this was exactly the intention of IWC when they began to work on the new collection. The 75th year is always a bit of an awkward anniversary, because it’s irrefutably a milestone, but it also falls short (by a third of the way) of being a full centenary, when you’d feel properly justified in really pushing the boat out. Perhaps that’s even more reason to celebrate. It’s unlikely that IWC deliberately set out to be awkward when they first made a large watch in 1939, a time of shrinking wristwear, but whatever their intentions were, there is absolutely no doubt that the Portugieser watch of IWC remains defined by what it has accomplished. On this deceptively simple premise of large watch and unflinching commitment to precision, IWC have built a veritable fleet of high-performance timepieces. Despite the commercial success of other IWC collections such as the appealingly accessible Portofino and the ruggedly stoic Aquatimer, it is the Portugieser that continues to dominate the upper end of the complications spectrum at the Schaffhausen company. 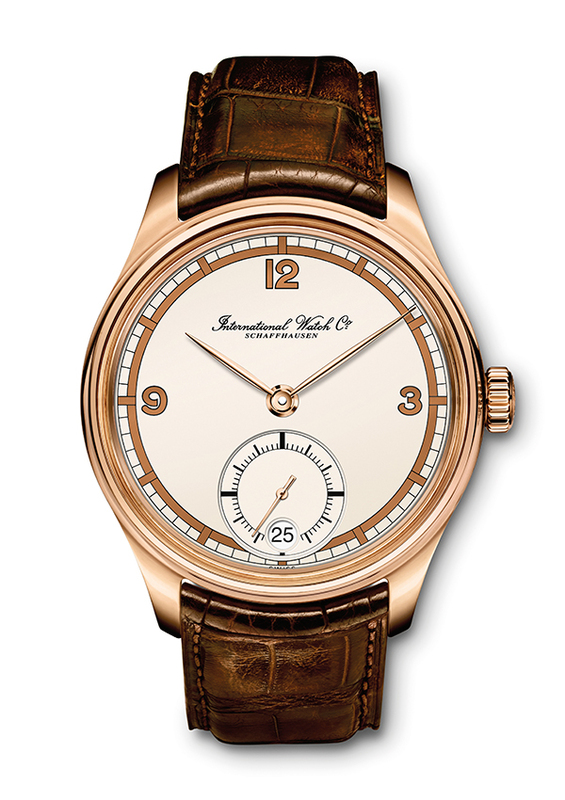 It is the Portugieser that continues to extend the watchmaking horizons of IWC. It is the Portugieser that continually expands our relationship with mechanical watchmaking.